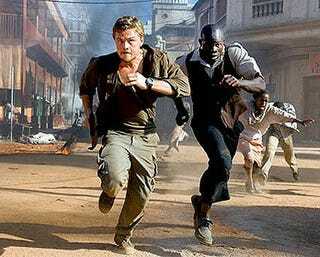 If you haven't seen the film Blood Diamond you're among the lucky ones. You'd think a film with a body count in the hundreds would be at least fun to watch and Leonardo DiCaprio, typically, brings energy to a film. And if that wasn't enough, there's always Jennifer Connelly. But no, the film is fairly boring. It tries to be both an action film and a movie about geopolitical intrigue. The body count in The Constant Gardner is much lower, but in terms of films about what we're doing to completely screw Africa it's hard to top it. We're sure no one is going to make a movie anytime soon about the Toyota floor mats recall, but if they do we don't see TyrannosaurusWRX buying tickets for it. But seriously, be safe Toyota drivers.